China’s development progress in recent years has driven global progress on the MDGs. Between 1981 and 2010, 680 million people were lifted out of poverty in China. This comprises three quarters of the world’s total decline in extreme poverty over the same period. Jose Graziano da Silva, Director General of the UN Food and Agricultural Organization (FAO) stated at the end of 2013 that “…it was basically due to China’s achievements if we were able to push down the total number of undernourished people in the world from 1 billion to 840 million over the last years.” China has also achieved several MDG targets ahead of schedule, including targets on poverty and hunger reduction, universal primary education, eliminating gender disparity in primary and secondary education, reducing child mortality and improving access to safe drinking water and sanitation. When it comes to implementing the post-2015 development agenda, China believes that redistribution through North-South cooperation should remain the political deal at the core of the new development framework, just as it did for the MDGs. China recognizes that it too has a large role to play not only in its own continuing development, but also in assisting fellow developing countries in Africa and least developed countries (LDCs) through South-South cooperation. By its own calculations, China has provided development assistance to more than 120 other developing countries. Despite China’s growing economic and political influence and active participation in South-South cooperation, China argues that such cooperation should serve as a secondary, “useful” supplement to North-South cooperation. Why? Because China supports the application of the principle of CBDR, in which all countries would be responsible for working towards the post-2015 development goals but with differing levels of responsibilities depending on their national capacities and resources. In the same vein, China supports a universal development framework, but argues that Sub-Saharan Africa and LDCs should be given top priority for assistance. As the major economic figure of the South, China has collaborated extensively with the G77 bloc to formulate negotiating positions on the Sustainable Development Goals (SDGs), including the G77’s Common Position on Means of Implementation for the SDGs, and has advocated as a part of the bloc that each country should determine its own means of implementing the SDGs domestically. In addition, the recent G77 + China summit ‘For a New World Order’ in Bolivia, the bloc advocated for a new world economic order that would better meet the needs of the Global South by reducing inequality, improving cooperation, and respecting sovereignty. A major area of contention in the post-2015 negotiations is on the question of how and whether to include peace and governance objectives in the framework. Like most of the rest of the world, China does recognize the strong links between development and peace. As Foreign Minister Wang Yi put it, “in advancing the development agenda, we must cherish peace as we do our eyes.” However, China is opposed to the inclusion of goals around peace and governance in the post-2015 agenda. 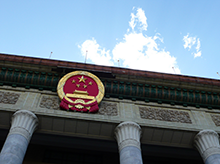 China argues that these are political and not development goals, which should be left to other multilateral fora, and above all to countries themselves in accordance with China’s policy on non-interference. In a joint statement with Indonesia and Kazakhstan during the Eighth Session of the Open Working Group on SDGs (OWG 8), China argued “the promotion of durable peace has been most effectively addressed through other avenues” and proposed deleting this topic area altogether later in OWG 11. China has the potential to influence the contours of this debate, and the perspectives of the G77, significantly. The remaining question is how much China will want to advance its own position in the post-2015 negotiations. Taking a strong leadership stance would go against China’s general conservative foreign policy stance, best characterized by Deng Xiaoping’s maxim of "keeping a low profile and hiding one's brightness." As was stated by Thomas Wheeler at SaferWorld in late 2013, China’s interest in the post-2015 development agenda has not been high. The first half of 2014 has not proven dramatically different. As general interest in the post-2015 agenda crescendos into the fall’s UN General Assembly meetings and beyond, China could still choose to become more involved in advancing its own policy goals in the SDGs, though without a fundamental change in its foreign policy approach, that change in posturing seems unlikely.